MEET ALAN B. TUTTLE. A snapshot of the life of the man behind the doors. Growing up poor by many American’s standard of living, Alan Tuttle was rich by all counts in family, talent, love, purity of spirit and integrity of purpose. Perhaps because, perhaps in spite of being entirely self-taught as an artist he believes that we have an obligation to assist those who recognize and nurture the creative spirit. He feels strongly that making a meaningful contribution within our communities is one of the most vital ways in which we can do this. Indeed, he has proven that art can inspire and commit people to socially responsible action. Living in San Francisco in the early 90’s he did a series of portraits of the homeless. These extraordinary studies can be seen at the National Coalition for the Homeless in Washington, D.C. Presented as an incentive to dialogue, the portraits led to a series of fund raisers in the Bay Area that raised nearly $50,000 for charities that aided the hungry and homeless. During the 18 years that followed, Alan organized or helped to organize hundreds of “Empty Bowls” projects. Through fundraising activities in schools across the USA, $1.3 Million was raised and contributed directly to soup kitchens, food pantries, and other essential organizations who aid the hungry and homeless. The “Empty Bowls” project was a concept initially developed by The Imagine Render Group. Members of the public were invited to purchase a ticket for sharing simple bread and soup dinners with students who crafted handmade bowls. After dinner, each guest was allowed to take his or her bowl home. Students volunteered at soup kitchens, researched issues locally and at the national level, then presented their findings at the dinners. The response was far beyond anything that could have been imagined. People became totally immersed in both making and appreciating each bowl’s design merit while contributing much needed finances to a worthy cause. And today, many of these former students continue to remain active in local programs. The lyrics written by a popular song writer in the 60’s told of teachers who taught that flowers are red and leaves are green. As a child growing up in provincial northern New York, I soon learned that the ability to replicate what I saw would earn approval from my peers and this, more than art for art’s sake, was of utmost importance. In that sense, I was catering to the market. That is, I was learning to paint that which was safe, that which would earn a young boy praise. Today, of course, the flowers and leaves that appear in my paintings are interpretations of many hues and forms not always immediately apparent to the untrained eye. In my junior year of high school I traveled to Madrid, as an exchange student. With little money, but ample time, I spent many days exploring the halls of El Prado and other museums where I was captivated by the works of Masters such as El Greco, Velasquez and Goya among others. Self-taught since the beginning, I studied their tradition laden techniques as well as their expression of socio-political commentary. Their balance of light and shadow—chiaroscuro—and multi-layered glazes would later significantly influence the development of my under painting style. As an avid traveler, I have since visited nearly fifty countries and sated my mind with visual images of the art, culture and people of each. My greatest inspirations however most often originate closer to home; my environment, my social interactions, my politics. True creativity is never about that which might be marketable, evocative or popular. Commercial success is meaningless if it means repeating yesterday’s successes. Repetition leaves me feeling hollow. Though I am grounded in realism, I am not married to a single style or ism, preferring instead to select from my large “toolbox” of techniques and interpretive skills to freely communicate my message without placing the burden of convoluted interpretation on the viewer. Critics have commented that my “style” is elusive or all over the map, but not being held to what others may need to define as an “Alan Tuttle” gives me the freedom to communicate an individual, highly personal perspective through each piece I create regardless of medium. If I have seen it done, I have little interest in doing it. To avoid being influenced consciously or unconsciously I seldom attend museums or galleries showing the work of my contemporaries. This is not out of lack of respect for the work of other artists, but rather my way of isolating myself to assure that my work and my thoughts are my own—as original as possible. Thus I tend to work in the reclusive atmosphere of my studio while remaining fully engaged in living life outside of its confines. There is no substitute for experiencing the outdoors with all of the senses, but my love of plein aire painting is tempered by pervasive medical conditions: Crohn’s Disease, Arthritis and Migraines. Still I continue make a concerted effort to initiate the development of my landscape based paintings on location. My singular goal in life is to embrace and convey my interpretation of its array of realities each and every day through the mediums of painting and sculpture. 2012 “For the Sake of Art”: Solo Show Rehoboth Art League: Rehoboth Beach, DE. 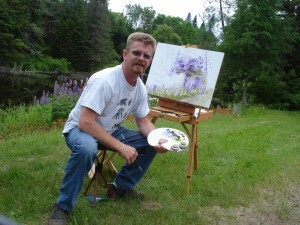 2010 “North Country Arts Council’s Fall Art Show”: Invitational/Featured Artist Watertown, NY. 2007 North Country Regional Juried Art Show: Gibson Gallery, SUNY Potsdam, Potsdam, NY. 2006 “North Country Artist’s Guild Juried Exhibition”: Watertown,NY. 2005 International Juried Art Exhibit 2005, Frederick Remington Art Museum: Ogdensburg, NY. 2005 Lake Placid Center for the Arts, International Juried Exhibition: Lake Placid, New York. 2005 National Oil & Acrylic Painter’s Society, “Best of North America”: Lake Ozark, MO. 2005 “One World Many Visions”, Northbrook Public Library: Northbrook, Il. 2005 On Line Exhibition, Art Kudos, International Juried Art Competition & Exhibition: www.artkudos.com, sponsored by www.artshow.com : Norcross, GA.
2005 Artist’s Magazine, 22nd Annual Art Competition, Award: Experimental Oil- Honorable Mention, publication Dec. 2005 Edition. 2005 North Country Regional Juried Art Show: Gibson Gallery, SUNY Potsdam, Potsdam, NY. 2005 70th Annual National Exhibition of the Cooperstown Art Association: Cooperstown, NY. 2005 “North Country Artist’s Guild Juried Exhibition”: Watertown,NY. Awards: 1st Place in Oil & People’s Choice. 2005 “Art of the Northeast 2004”, Silvermine Guild Arts Center New Canaan,CT. 2005 National Juried Exhibition, Plano Art Association, Plano, TX. 1999 Adirondack Life Juried Art Show, Group Show, Lake Placid Center for the Arts, Lake Placid, NY. Member of the Friends of Gibson Gallery. 1991-2010: Founder, Chairman, “Giving Back”: A not-for-profit national program to raise the awareness of the problems of homeless people and money for charities that aid them. The program has been responsible for raising over $1,000,000. It showcases a series of paintings of the homeless. Numerous newspaper, magazine articles on “The Domiciles Project”, a public art project created and directed by the artist. Numerous newspaper articles and extensive media coverage in New York and California since 1991 on the “Giving Back” program as well as Artistic endeavors. Sunset Magazine, Landscape Design February 1991. San Francisco Chronicle, August, 1993. WWNY TV: “The North Country’s Finest”, Television Segment on my work and studio, 2003. Artist’s Magazine, 22nd Annual Art Competition, December 2005. All material including but not limited to created and photographic images, text, design and special effects contained within The Domiciles Project website are the property of Alan B. Tuttle, and as such may not be copied, altered or transmitted in any form by any means or media without the signed written express permission of Alan B. Tuttle. * Teachers in public and private schools and universities may reproduce images not in excess of 11" x 17" for classroom instructional purposes or to produce promotional materials for use within their school district only. * Students may produce images of the doors not in excess of 11" x 17" as part of an assignment only. * Other Persons with a legitimate not-for-profit purpose or public presentation in conjunction with or resulting from the initiatives of The Domiciles Project may reproduce these images not in excess of 11" x 17". * Members of the Press may print and use images and direct quotes from The Domiciles Project website in conjunction with articles or reports which positively support The Domiciles Project, providing the following credit line is included in any such article or report: Certain images and text contained herein are the sole property of Alan B. Tuttle/The Domiciles Project and may not be used for profit, or reproduced in any way without express written permission of Alan B. Tuttle.